Back in July, I mentioned that I'd be doing a product review from CSN Stores. 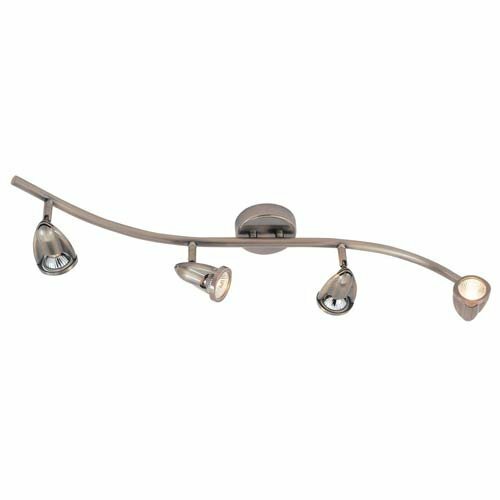 Since we're doing a kitchen remodel in the house we recently purchased, I thought I would review a lighting fixture from CSN Lighting. Here is my honest, impartial review of the shopping process, product, and overall experience. Navigating the CSN Stores sites can be a bit confusing and overwhelming at times. It's a bit difficult to find exactly what you're looking for. In my case, I was looking for directional (or track) lights in a brushed nickel, silver finish. Whittling down the options was complicated. They have SO many products, so wading through them can be a bit daunting. On the plus side, they do have SO many products, so there's a very wide selection to choose from. I really like that they have so many items that include free shipping, too. That was really nice not to have an extra charge put on to the bill for shipping. The shipping was fast and efficient, too. No complaints there. When the light came, I immediately opened the box to check it out. Gorgeous! It was exactly what I was hoping for. No complaints there, either. The problem is that I ordered the light back in July, and we didn't get around to testing it out or seeing if it would work in our kitchen until earlier this month (January). This was our mistake. When we went to inspect the light more closely, we found that it was not going to work in our kitchen set-up. And, we were disappointed to find out that we were outside of the CSN 30-day return policy. I just assumed the light would work, when we received it, instead of taking a closer look. So, now we are trying to figure out what to do with this light that we are not going to use. Again, this was not CSN's fault. Their return policy is clear. The light is pretty, and built well, but just not functional for us. So, I was satisfied with the shopping experience, the ordering process, the shipping, and the item. I wish I wasn't bound by their 30-day return policy, but that's my mistake. Would I shop CSN Stores again? Probably. They run some really great sales/discounts, and have a really wide selection. It really is like a huge online shopping mall. So, I would recommend them, but be sure you're aware of the 30-day return policy. Lesson learned! Something like this recently happened to me with another online retailer. I'm keeping my fingers crossed that our problem can be rectified. I hope you can come up with a good solution. I have this same light fixture over my computer area. For anyone who thinks about getting one of these, think twice. It does give off a lot of light, but it blows out bulbs continuously. Now I wish I had bought something else. Happy 100 WINNERS Announced . . . FINALLY! DEAL ALERTS: Lots of deals!